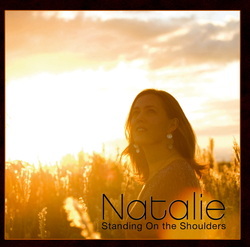 Natalie's captivating voice and original melodies for Hebrew liturgical pieces, as well as introspective English ballads, are gifts she can now share with the world in this debut recording. Like a work of art, this lovely CD can be enjoyed over and over, with each time being as pleasing as the first. Guest vocalist Cantor Chayim Frenkel harmonizes beautifully with Natalie in Mi Shebeirach (original melody using Debbie Friedman's lyrics). Other selections include Carry Me, Ma Tovu, Elohai, Sh'ma/V'ahavta, Adonai, Ahavat Olam, Im Ein Ani Li Mi Li, Yih'yu L'ratzon, Dodi Li/Od Yishama, Sweet Gentle Night, Prisms, Esa Einai, and Oseh Shalom. 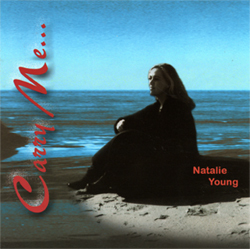 "Natalie Young’s sophomore release “Natalie” is a giant leap forward for the singer/songwriter. While the powerful songwriting evidenced in her first release remains, on this project Natalie enlisted the aid of the award winning Positive Jewish LivingTM creative team of Beth Schafer and her producer/engineer John Marsden. Schafer & Marsden wrapped Natalie’s beautiful melodies and soaring voice in lush guitars, hypnotic rhythms, and angelic harmonies. Special guests on the release include sax & flute from Charlie DeChant of Hall & Oates, and the drumming talents of Charlie Morgan of Elton John’s band. From the start of the CD’s first track, the sing-along “Halleluyah,” it’s clear that Natalie has a gift for writing melodies that are memorable, singable, joyful and when combined with sacred texts, ultimately Jewish! Her voice wraps the listener in a warm loving embrace that leaves you full of contentment and peace. Project highlights include her 6/8 infused “Hinei Mah Tov,” the hypnotic cadence of “God of Creation,” and the world beat influenced “Adonai S'fatai.” The 8 songs on this release leave you feeling as if you’ve been touched by the Divine, and come away knowing that love will conquer all. This isn’t just music for worship, it’s music for living!" Standing On The Shoulders, the second album from Cantor Natalie Young, offers spiritual and musical refreshment for ears and souls weary of juvenile and derivative efforts from contemporary songwriters. Cantor Young is a trained composer and her innate musicianship, combined with her deep understanding of the texts creates a collection of liturgical pieces that sound both complex and harmonically pleasing. The mantra-like, “Adonai Sefatai,” a preparatory prayer that is often recited as a whisper, is handled with sensitivity by Young. The use of eastern instruments, often employed as a sort of gimmick by some artists, sounds quite authentic in support of the harmonic progressions of this piece. Young’s voice conveys devotion and purity. “Halleluya,” a setting of Psalm 150, is reminiscent of a pop anthem, with appropriate instrumentation and rich harmonies. The melody line is easy to join in, and it seems destined to become a synagogue repertoire staple. It is a pleasure to finally hear music for synagogue that sounds both youthful and sophisticated!